For her fifth book, Mo Hayder has returned to the character she introduced in her cracking debut BIRDMAN and its equally dark, thrilling follow-up THE TREATMENT, DI Jack Caffrey. In RITUAL, Jack has recently broken up with Rebecca and moved to Bristol, as part of his long quest to achieve closure over the disappearance of his brother when the two boys were children. We, the readers, know what happened to Ewan, but Jack still does not, though he can sense it. Although emotionally attuned, he's on slightly the wrong factual track about those long-ago events. In RITUAL, he seeks out the 'Walking Man', a wandering vagabond who has recently been released from prison for torturing the killer of his young daughter, as Jack believes that their shared pain might somehow provide some solace. The main plot of RITUAL, however, concerns police diver Phoebe "Flea" Marley, who as the book opens discovers a severed hand in the Bristol docks. Flea is from a family of divers, and we discover that some years ago her parents died, and her brother barely survived, in attempting a dive in the bottomless Bushman's Hole in the Kalahari desert. Scarred deeply by her guilt, Flea denies her natural ability as a detective, and instead remains as a police diver, as when she's underwater she feels a kind of comfort and emotional connection with her parents. Flea's discovery of the hand brings in Jack as the investigating detective. He takes Flea's ideas about the case seriously, with the result that a second hand is soon discovered as well as some promising leads. In interleaving chapters, we see events from the perspective of "Mossy", a young heroin addict, who in his search for a fix ends up imprisoned in a run-down house with only an unnaturally small black man, "Skinny", for sinister company. Mossy allows his captors to extract his blood, and to film him acting-out terror, in exchange for drugs, but he soon realises that he's in a far worse situation than he can deal with. Meanwhile, Jack and Flea are separately discovering more about African tribal rituals and the trade associated with them: Flea via her friend "Tig", a reformed prisoner, and her father's old colleague, Kaiser Nduka, a disgraced academic; and Jack via more orthodox means. Jack soon identifies the owner of the hands, and discovers a link between a scam involving the sale of animal heads as talismans, and the blood that is being taken from Mossy. Independently, and later together, Jack and Flea piece together a horrible story about the sale of body parts for various magic purposes, and in an exciting climax involving several false deductions, get to the bottom of most of the story. Part of the pleasure of this thrilling book is the plot - trying to work out how all the threads will be connected - and pace; but another excellent aspect is how the author so well conveys the inner lives of her characters. In particular, in Jack and Flea, she has created two people who are struggling to come to terms with the same kind of pain, and who recognise and are in tune with each other from the start. I desperately hope Mo Hayder will write another book about these two, even though Jack is thinking about moving to East England on his fruitless quest, and Flea has more than a few loose ends to deal with, in particular the strange and so-far unrevealed activities of her damaged brother. Mo Hayder is, as usual, unafraid to write about horrible and horrific events in which political correctness does not figure. She constructs a gruesomely involving, imaginative story: although she does not hold back from the gory details there is always a purpose in these revelations. The result is a gripping book, high on atmosphere, convincing in its portrayal of major and minor characters and their emotions, and totally involving to the reader. 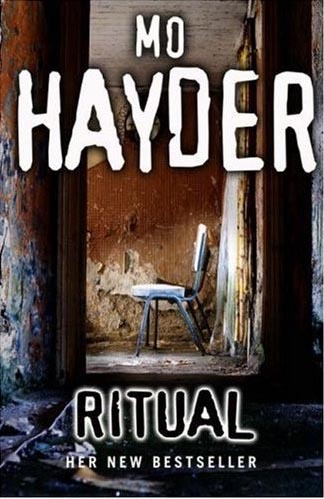 Read more reviews of RITUAL here and here.